Save Marinwood-Lucas Valley - our community, our future: De Blasio's Controversial Zoning Plan Stretches Definition Of "Affordable"
De Blasio's Controversial Zoning Plan Stretches Definition Of "Affordable"
Editors NotE: government intrusion into the housing market cause inevitable market distortions as any economist can tell you. It is not surprising that the more they meddle with the market, the more unhappiness and scarcity they create. A free market is the equitable and fair way to distribute scarce resources. Zoning is an arcane subject. Faced with verbiage like “calendar item N 1600036 ZRK” and “establishing within a proposed R8A District a C2-4 District bounded by a line 100 feet northwesterly of Atlantic Avenue,” most people’s eyes would be glazed with glass bricks after three paragraphs. Yet zoning determines what kind of buildings and uses the city will have, from single-family homes to 53-story towers. Calendar item N 1600036 ZRK on the City Planning Commission’s calendar Dec. 16was the de Blasio administration’s “mandatory inclusionary housing” plan, which would require developers building housing in 15 rezoned areas to rent a percentage of the apartments for below market rate. More than 180 people signed up to testify at the marathon hearing, and the line to get into it stretched around the block. In the rezoned neighborhoods, developers would choose between having 25% of the apartments rent to households averaging 60% of “AMI,” the area median income for New York City and its northern suburbs—$46,620 for a family of three, so a two-bedroom apartment would cost around $1,150 a month on average—or reserving 30% for families at 80% of AMI, about $1,550 for a two-bedroom. A third option, available in “emerging markets” outside Manhattan below 96th Street, would be “workforce housing” for families making an average of $93,000; a two-bedroom there would average more than $2,300. East New York is likely to be the first neighborhood rezoned, followed by the Jerome Avenue area in the southwest Bronx, East Harlem, and Inwood. Opponents see a gaping flaw: The “affordable” apartments created by the plan would still be too expensive for millions of city residents. “It ignores half the city,” said Ava Farkas of the Metropolitan Council on Housing. “We do not think it is going to create affordable housing for the people who need it most.” Half of city renters make less than the 60% of AMI that is the plan’s lowest level, she added. “We need to go back to the drawing board and determine what ‘affordability’ really is,” said Tiffany Lee, director of a Catholic social-justice ministry in Inwood and Washington Heights. The neighborhood’s median income is $37,000, she said, and it’s only $21,000 in the area east of 10th Avenue that’s currently slated for rezoning. The crowd was strongly against the plan, but thinned out considerably by the afternoon. The speakers split fairly evenly, though many had left by the time they were called. Supporters were almost all professionals—policy experts, affordable-housing developers, and architects. Opponents were elected officials, community activists, and ordinary citizens. 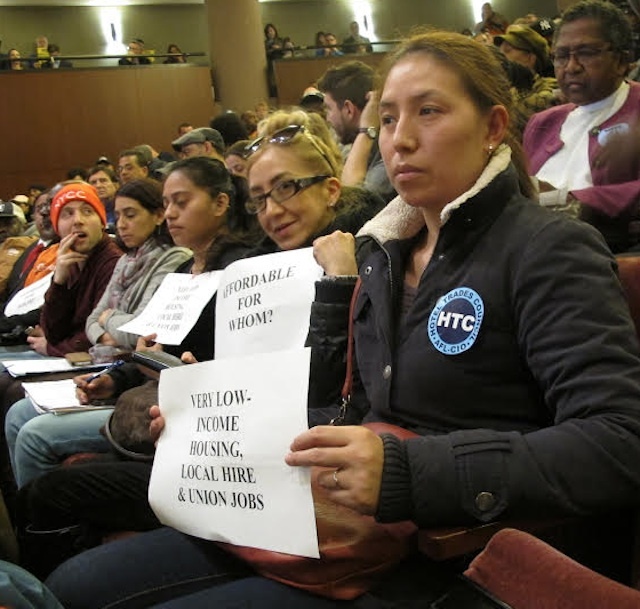 The depth of opposition to the plan appears to have surprised the de Blasio administration. In November, most of the city’s 59 community boards voted to recommend rejecting it, and four of the five borough presidents came out against it. Comptroller Scott Stringer issued a report this month that said most people in East New York wouldn’t be able to afford even the affordable apartments. The exception was Manhattan Borough President Gale Brewer, who said “these plans need major changes before we can accept them,” but then endorsed it. The administration has pushed back, winning the support of the AARP, and with four major labor unions—Local 32BJ of the Service Employees International Union, the United Federation of Teachers, the city employees’ District Council 37, and the health-care workers’ 1199SEIU—endorsing the plan, countering strong opposition from the building-trades unions. “Can you build affordable housing with union labor?” Steve Coyle of the AFL-CIO Housing Investment Trust asked rhetorically on December 14th, at an event announcing a $300 million partnership between the union housing fund and churches in the metropolitan area. Laborers Local 79 brought a few dozen members, carrying “No Giveaways to Real Estate Without Real Affordability and Union Jobs” signs. “Good union jobs and affordable housing are two sides of the same coin,” said Maritza Silva-Farrell of the Real Affordability for All coalition. The second part of the administration’s plan is Zoning for Quality and Affordability, which would let developers build slightly higher in exchange for including below-market housing or apartments for the elderly. It would also end the requirement that they construct parking lots on-site, as long as the building is within half a mile of a subway stop. That possible loss of parking has irked many in the outer boroughs. Two-thirds of people in Queens live beyond the reach of subways, Borough President Melinda Katz told the commission. Building parking lots is expensive, affordable-housing developers responded, and most of the spaces built aren’t used. 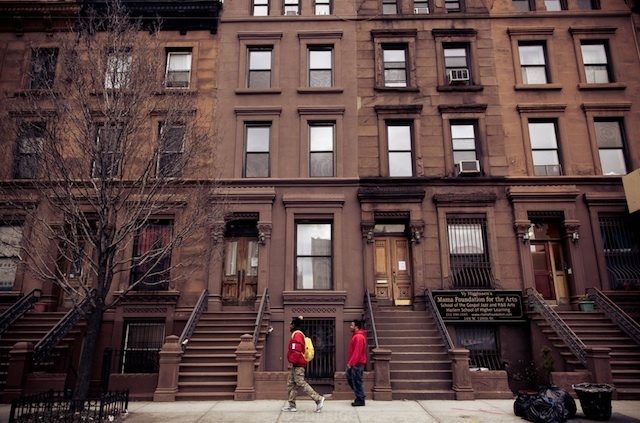 “This unnecessarily puts the creation of affordable housing fundamentally at odds with maintaining a reasonable scale of development,” said Andrew Berman of the Greenwich Village Society for Historic Preservation. Williamsburg/Greenpoint and West Chelsea/Hudson Yards, rezoned in 2005 to allow more market-rate development in exchange for some affordable housing, “look more like Hong Kong or Miami than New York City, and they are among the least affordable, most rapidly gentrifying parts of the city,” he added. The height increases allowed will be only 5 to 25 feet, the administration responds. The crux of the debate remains whether the plan will increase the supply of affordable housing. Kathryn Wylde of the business advocacy group Partnership for the City of New York backed the plan, although she criticized the “social engineering that requires affordable units in luxury buildings.” Having a city where 47% of people pay more than one-third of their income for rent discourages companies from locating here, she said. The Real Estate Board of New York, the main developers’ trade group, also endorsed it, although their representative Mike Slattery said the reduction in rents might cost more than the tax subsidies developers receive. A main criticism of the plan is that by encouraging market-rate development in working-class and poor neighborhoods, it would cause “secondary displacement,” in which speculation drives up land prices, and the prospect of higher rents encourages landlords to drive out current tenants. East Harlem is already experiencing significant gentrification. In East New York, the first waves of gentrification coming southeast from Bushwick and east through Bedford-Stuyvesant are lapping a subway stop or two away from the Broadway Junction area slated for rezoning. Supporters largely dismiss that concern. The market will continue pushing up rents regardless, said Mark Willis of the Furman Center at New York University. The de Blasio administration says the problem is the limited supply of housing, and it’s expanding legal services for tenants to counter harassment and eviction. While there are other subsidies available to create lower-income housing, the mayor’s Housing First plan calls for only 16,000 apartments aimed at people who make less than $35,000, about one-third of the city. That’s four times as many as Michael Bloomberg did, but far less than the 60,000 homeless people, the estimated 250,000 rent-stabilized apartments lost in the last 20 years, the 270,000 people on the waiting list for public housing, and the 425,000 low-income apartments the Housing First plan estimated that the city needed in 2014. Opponents call for much more low-income housing. The Association for Neighborhood Housing Development has urged that the program be revised to give neighborhoods a “deep affordability” option, in which 30% of the units built would be reserved for households that make less than 30% of AMI; these would rent for about $625 a month or less. The Real Affordability for All coalition plan calls for 50% of the housing built to be at or below the median income for the neighborhood, whether by community district or ZIP code. Even if the minimum wage were raised to $15 an hour, said Maritza Silva-Farrell, those workers would still be bringing in only $25,000 to $30,000 a year. “If we’re giving taxpayer money to developers, it’s really important for that housing to go to the people who need it,” she told the panel. Some supporters of the plan, such as Brewer, also urged that it create more housing for lower-income people. That is easier said than done when the main method of creating that housing is encouraging or requiring trickle-down from private development. There are large gaps in the complex network of government subsidies. Apartments for upper working-class or lower middle-class people, at 50-60% of AMI, get federal low-income housing tax credits. But it’s difficult to get subsidies for people at 60-90% of AMI—middle class, but still too poor to afford market-rate apartments—and there are very few for the working class and the poor, those under 40%. The administration did not demand more low-income apartments, said Housing Preservation and Development Commissioner Vicki Been, because “requirements that were too onerous would result in no housing.” Creating middle-class housing through this method, she adds, enables city funds to go to lower-income housing, through programs like ELLA (Extremely Low and Low-Income Availability), which subsidizes construction of buildings where 40% of apartments are reserved for people making up to 50% of AMI, with 10% for those at 30%. In East New York, HPD says, the first 1,200 units built under the plan will be below market rate. The rent on the cheapest 120 will be $453 for a studio and $583 for a two-bedroom, it says. Developers say it’s impossible to run housing for people making $23,000 without operating subsidies. At 30% of AMI, “you can’t even pay the operating cost of the building,” said Adam Weinstein of the nonprofit developer Phipps Houses.